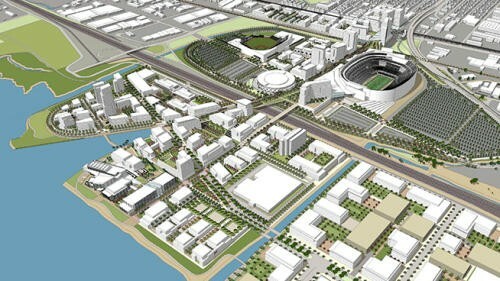 When the Bay Area News Group recently published a leaked copy of the development plan for the Coliseum and the surrounding area, the plan quickly came under intense criticism as being a lousy deal for the Oakland Raiders and one that would not persuade the team to stay in Oakland. The proposal also depends on hundreds of millions of dollars in public funding. But for the project’s neighbors, residents of East Oakland, the worst thing was what wasn’t there: any mention of the community benefits that the Oakland City Council and Alameda Board of Supervisors had required the developer, Floyd Kephart, to include. Their negotiating agreement with Kephart’s company, New City LLC, specified a list of community benefits: local hiring and training, well-paying jobs, contracts with local businesses, affordable housing, and more. The leaked development proposal included no mention of these issues. City planners and councilmembers credited a coalition of unions and community organizations, the Oakland United Coalition, with helping to shape the city’s development plan for the area. The final version of the plan included many details on community benefits. Members of the coalition denounced Kephart’s omission of community benefits in the plan he submitted privately on June 21. “This development will be on public land, using public money, and needs to serve the public good,” said Esther Goolsby, an East Oakland resident and activist in Communities for a Better Environment. Goolsby, along with other members of the coalition, met once with Kephart in May. At first, “it went well,” Goolsby said. “We were prepared.” Members of the coalition presented detailed proposals. Kephart listened, she said, although “he was looking at his watch toward the end.” Kephart, in turn, explained his goals for the project. Then coalition representatives asked Kephart if he would meet with them to discuss these proposals. Jackson said Kephart had explained that he needed to work with the Raiders and with city officials. “Basically, he had bigger priorities than the community,” Jackson concluded. Goolsby was especially indignant about Kephart’s reference to the old cliché that a camel is a horse designed by a committee. “He said when there are too many hands, things get messy,” she recalled. Kephart did agree to meet again in the first two weeks of June, but then cancelled the meeting and took no steps to reschedule it. Activists say that provisions for local hiring and good jobs are critical at a time when the median incomes of Black and Latino families in Oakland are lower than they were fifteen years ago. “This is a development that’s not just going to impact myself, but my kids,” Jackson said.